Rich leathers, wools and twills play off the deep interior finishes in this classically styled collaboration between Wade Weissmann Architecture and Peabody’s Interiors. 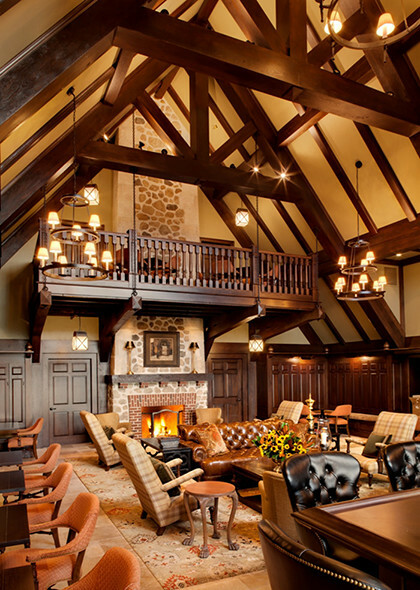 Inspired by the prestigious golf clubs of Ireland, Erin Hills’ clubhouse and cottages were designed to highlight the natural beauty of the course and its surroundings while creating an atmosphere tailored toward comfort and camaraderie. Envisioned as the latest in a lineage of stunning courses with an equally stunning campus, Erin Hills was built to reflect a classic Celtic style with the luxuries today’s golfers come to expect. From antique Audubon prints and Irish artwork to exclusively commissioned quilts for each guest bed, one-of-a-kind details provide Erin Hills with a character befitting the rich heritage of the game.